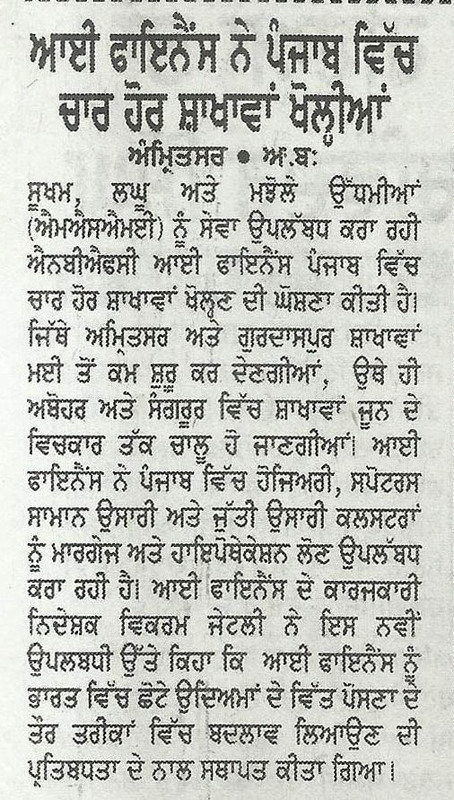 Sukhbir Singh approached Aye Finance with the hope of finding a solution to his debt crisis. In over 2 years that he has been with Aye Finance, he has come out stronger than ever, his worries are behind him, his business is growing and his employees are content. Now as he graduates to second cycle loan with Aye Finance, we are glad to be able to support such a pleasant natured man. 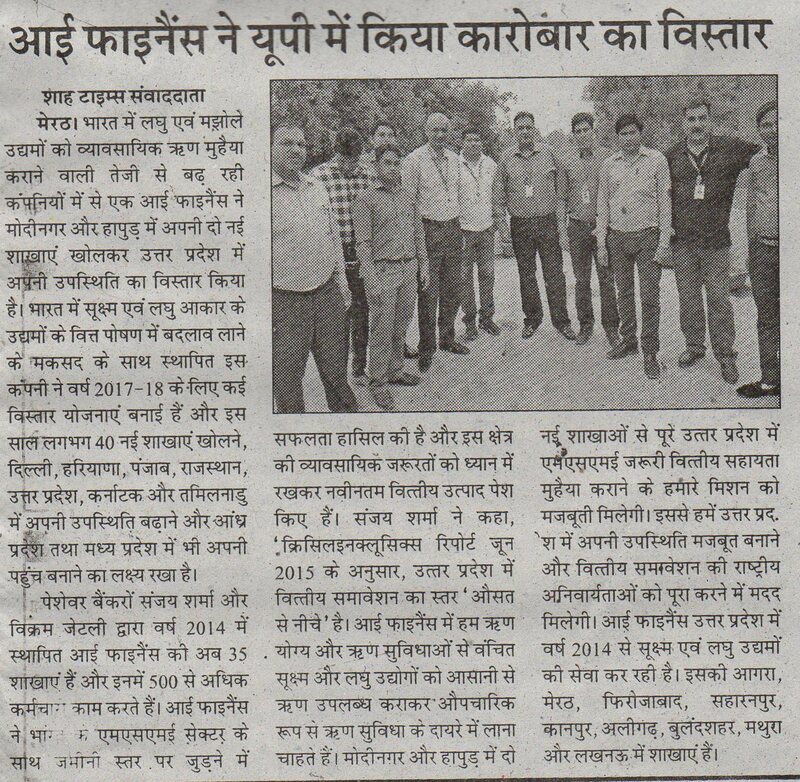 Located in Panipat, Haryana, his manufacturing business ‘Gautam Handloom’ is now 15+ workers strong. He is completely involved in the work, as he has been since the ground up. 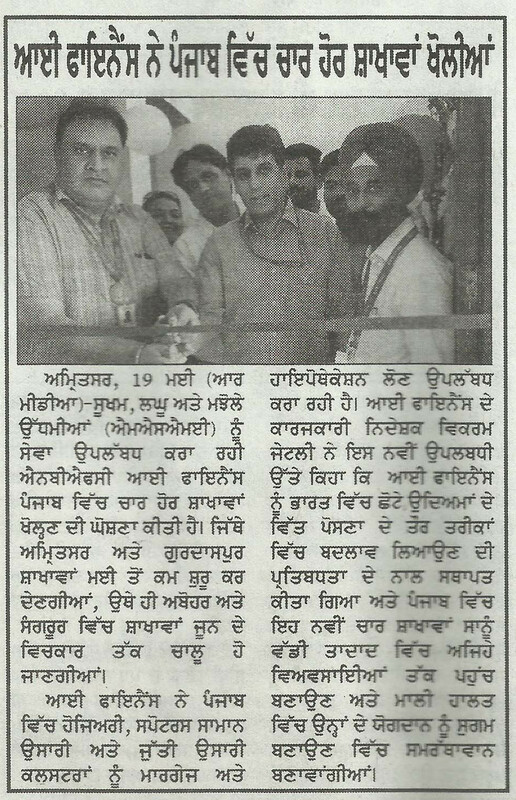 It is truly an inspiration to see Mr Sukhbir reap the rewards of his labor. When one enters his factory, they are immediately surrounded by a plethora of colors and patterns, stretching from floor to ceiling. These are of-course the Gupta Handloom rugs, carpets and bedspreads stacked all over. 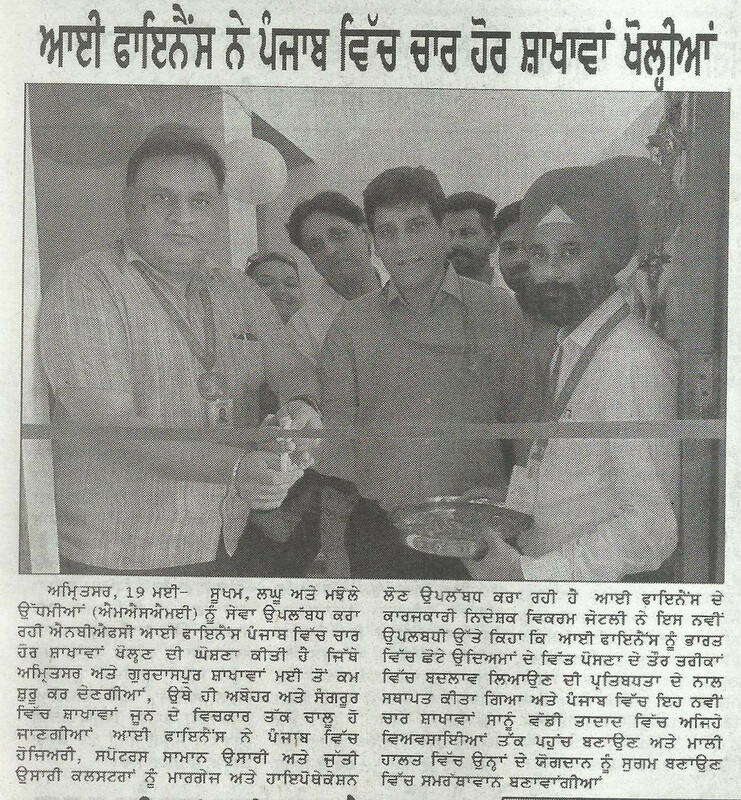 Mr Sukhbir is a testament to the fact that 40% of our national industrial output comes from these very industries. Keep prospering and keep “Make(ing) In India”! Mr Chowdaiah owns a silk-weaving manufacturing factory. With our rapid growth in South India, Aye has managed to help many wonderful customers such as him expand their business. And, while his business is new and fragile, a tough spirit and great entrepreneurial tactics have helped keep Mr Chowdaiah afloat. But now thanks to Aye Finance, Mr Chowdaiah has disposable income for capital investment, debt repayments and to pay his 5 skilled workers. 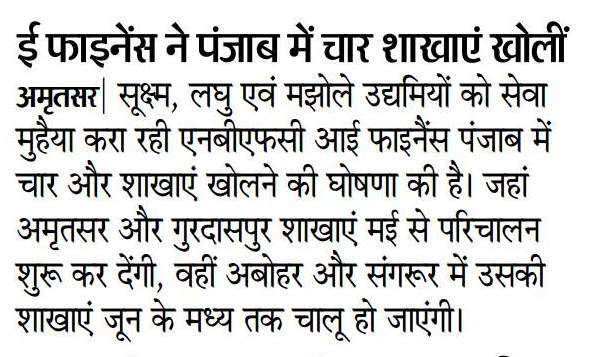 A loan of Rs 1.5 lacs has installed in him, a sense of security and purpose. It is always encouraging to know someone has the faith to invest in you, and for hard working customers such as Mr Chowdaiah, we are glad to provide him with our capital and our support! Welcome to the Aye experience, Mr Chowdaiah! 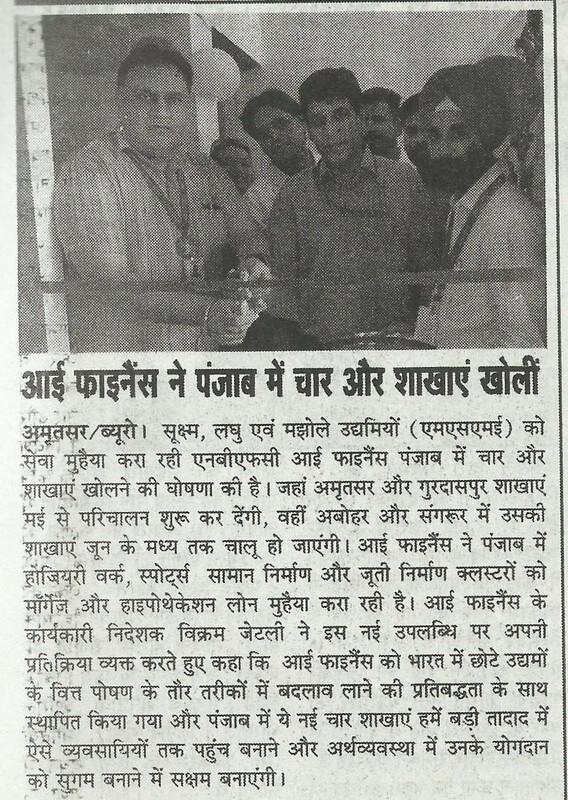 Mahendra Kumar is the proud owner of a Sports Goods Manufacturing business in Saray Kaji, Meerut. Employing over 15 skilled workers, his most profitable item of production is the red leather cricket ball every Indian cricket-lover desires. A true example of a professional, Mahendra repaid his first loan with us a couple of months before the tenure, and quickly graduated to a Rs 7 lac loan in his second cycle with Aye Finance. He is confident and hard-working, spending most hours of the day in his shop, supervising and helping out with the work. Mahendra’s workers have nothing but praise for him, speaking of how accommodating and understanding their ‘boss’ is. Here at Aye Finance, it fills us with great joy to see such socially active members of community using their well-earned profits to further help other members of their society. The impact Mahendra is creating on those around him, is just one of the many ways we try and focus on the aspect of social good and mentoring. 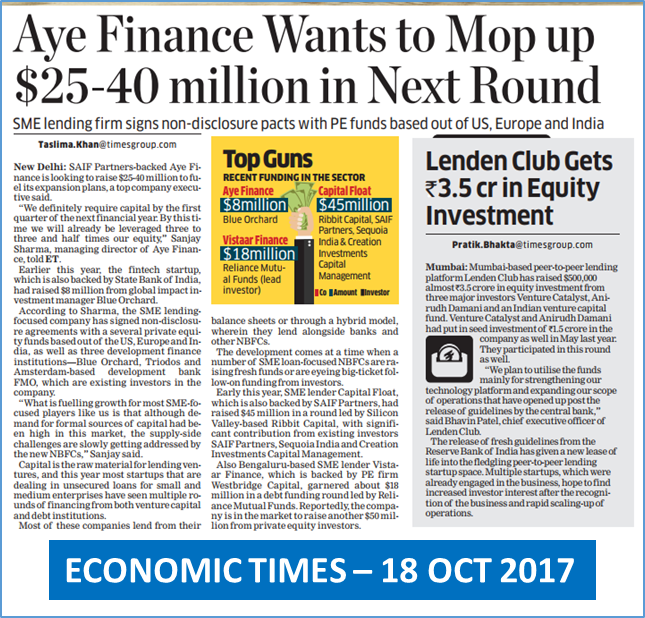 MSME lender Aye Finance has raised ₹233.62 crore in Series D equity round, led by New York-based investment firm Falcon Edge Capital. Existing investors, CapitalG, LGT and MAJ Invest, also participated in this round. 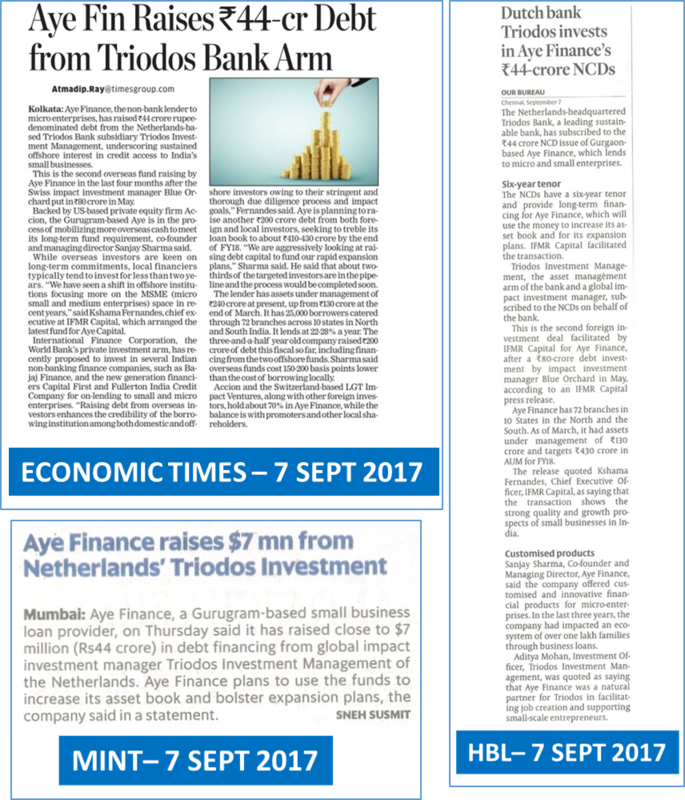 The fresh funding will be used to drive the lender’s growth and to develop financial and and data-mining technologies. 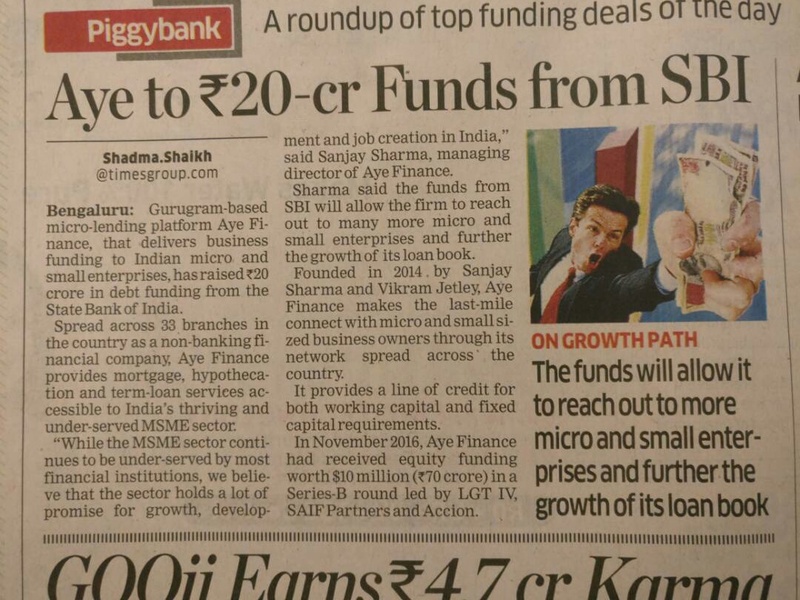 “The funds from this round will help us continue the strong growth in lending to micro enterprises across India. Our enhanced focus on Machine Learning has benefited from the mentorship of Google Launchpad programme, and this has enhanced our ability to create a transformative change for the excluded micro enterprises. “In the coming year, we will make our services to our clients go beyond finance, and this will support our vision for holistic impact, which will power the growth of micro enterprises,” said Sanjay Sharma, MD, Aye Finance. 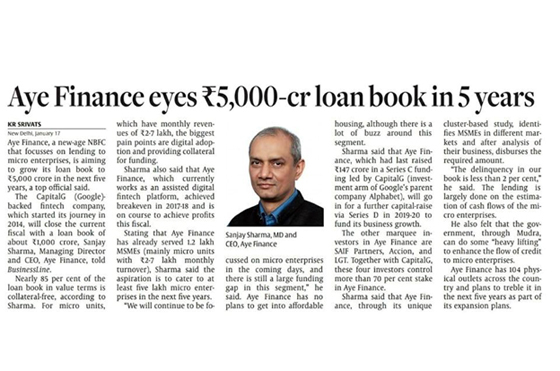 “Since our investment eight months ago, Aye has almost doubled its book and proven its ability to scale branches profitably,” said Kaushik Anand, Head of India Investments at CapitalG. In order to empower the expansion of the Indian MSME sector , Aye Finance is delivering business loans against mortgage or simple hypothecation accessible to India’s thriving and underserved MSME sector. Founded in the year 2014 by bankers Sanjay Sharma and Vikram Jetley, Aye Finance has rapidly grown its footprint through 33 branches spread across India. Recognising the states of Tamil Nadu and Karnataka as the centers for manufacturing, handloom, and a variety of small-scale industries, Aye Finance has already disbursed loans worth Rs. 10 crore to the Micro and Small Entrepreneurs in these states. Aye Finance offers business loans to deserving micro enterprises that do not have prior credit bureau history. 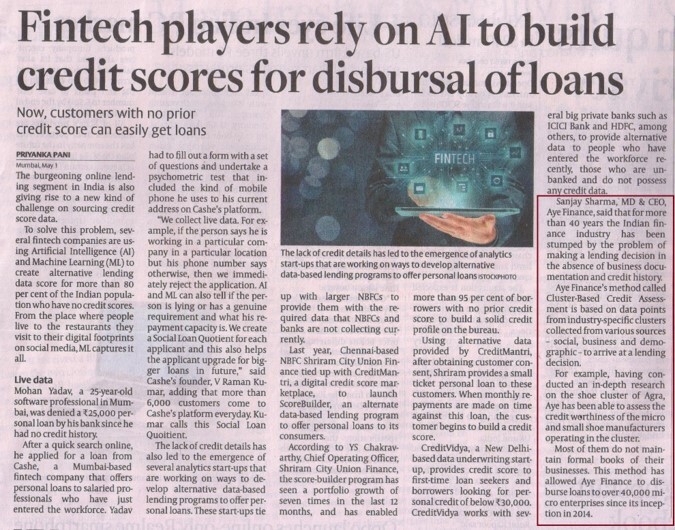 This effective credit appraisal coupled with the use of modern workflow automation and an engaged workforce is helping bridge the gap between the MSMEs and organised lending. 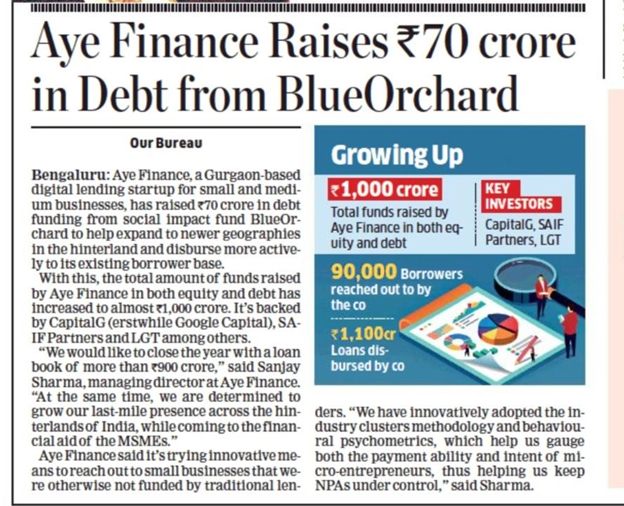 Aye Finance has already impacted an ecosystem of over 100,000 families through its business enterprise loans and it is driven by a vision to impact over 10 million households by 2020 and become an admired player in its space. Seen as one of the biggest tax reforms post independence in 1947, the Goods and Services Tax (GST) is set to bring forth unprecedented transformation of the Indian economy. There is a lot of conjecture around whether our markets are strong enough to sustain the impact of a radical change of this magnitude, even when the country is reeling from the after effects of demonetization. But I strongly feel GST will prove to be a strong enabler for the startup ecosystem by providing a streamlined and effective tax collection process and remove the biggest bane of the of the manufacturing industry. GST is one unified indirect tax on the supply of goods and services, right from the manufacturer to the consumer. Credits for input tax paid at each stage will be available in the subsequent stage of value addition, making GST a tax levied essentially on value addition at each stage. It will consolidate a wide gamut of indirect taxes like VAT, Service Tax, Central Excise, Octroi or Entry Tax into one unified tax. The Indian startup community stands to gain considerably post the implementation of GST. And these gains will not just be limited to the manufacturing segment. Poised at the precipice of disruptive growth and development, let us understand how these young Indian ventures are going to be benefited from GST. 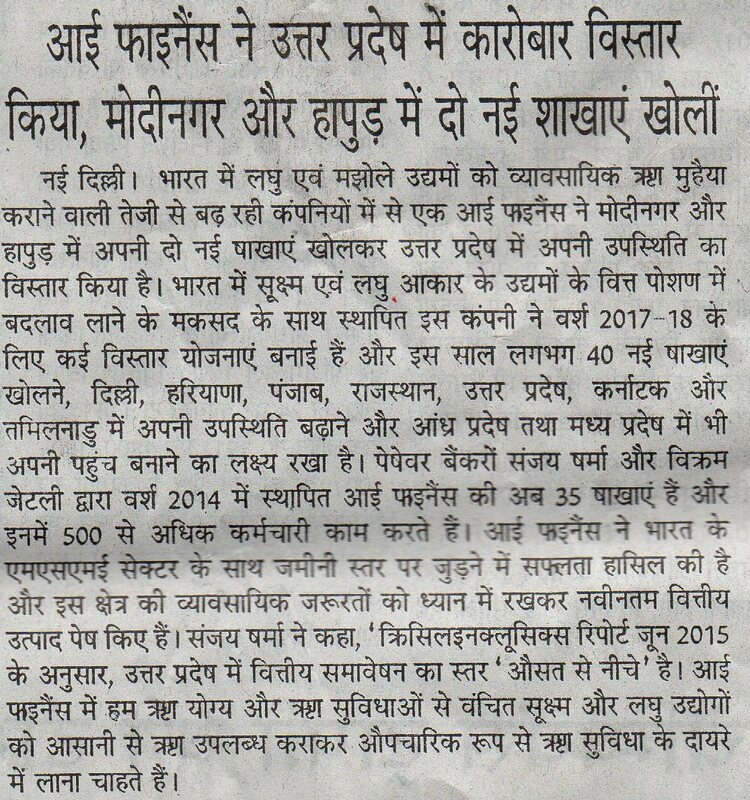 The implementation of GST is going to eradicate VAT, Sales Tax etc. Until now, every new business needed to knock on the multiple doors of the Sales Tax department for their VAT registration. Businesses operating in multiple states have to persevere their way through a host of different procedures, guidelines and fee structures. However, with the uniformity that the consolidated GST is set to bring in the economy, aspiring entrepreneurs will find it easier to not only start their business, but also grow it across different cities and states. With GST streamlining the tax system, India will become one seamless consolidated market. The big league manufacturers would no longer need to limit sourcing their ancillary products from their local markets, which they had to do to limit the various state taxes. They will see merit in reaching out to the millions of micro and small enterprises thriving in the tier 2 and beyond cities which have perfected their ability to keep the prices of their commodities at modest levels by managing at very low cost outlays. This will provide the much needed impetus to the ‘Make in India’ initiative in remote cities, and these cities will see an upsurge in the manufacturing startups, integrating Bharat with India. The roll out of GST will see a nation-wide need for a digital solution to manage the books of accounts, as calculating GST manually will be a challenging and time consuming task and might lead to errors. Startups in the IT and tech domain have an opportunity to cash on by providing customized solutions to MSMEs, who have resisted the move to digitization due to the heavy initial investment. With the micro and small enterprises obligated to deploy technology to enable computation of GST and to imbibe the GST policy overhauls, it will give an incremental boost to the Digital India campaign. The investment in technology will lead to process-level efficiencies, cost reductions and increased growth prospects. In the long run, GST is set to enable financial inclusion in the economy. With the MSME and Startup community migrating towards digital book-keeping and optimizing existing processes, they would be better predisposed towards fulfilling the eligibility criteria for credit facilities. Furthermore, FinTech organizations will find have easy access to the young and fast-growing ventures digitally, and extend them the line of credit needed to establish and grow their businesses. Although this may not be the immediate outcome achieved by GST, however, to know that we are covering the essential ground work for a spectacularly digital and streamlined India, surely seems like a compelling achievement to persevere for. The GST regime does bring up the issue of compliances to new procedures. There is likely to be some increase in compliance costs. Exempt enterprises may have increased sales tax burden. 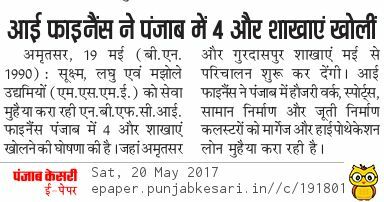 But these are minor hardships that these enterprises shall easily bear in time and then we will witness the true long term benefits of GST. Notwithstanding speculations and the initial teething problems, GST appears like a win-win situation promising radical reforms, GDP growth, reduced costs and a streamlined economy, and these are the cardinal elements required to lift the spirits of and empower the Indian Entrepreneur. 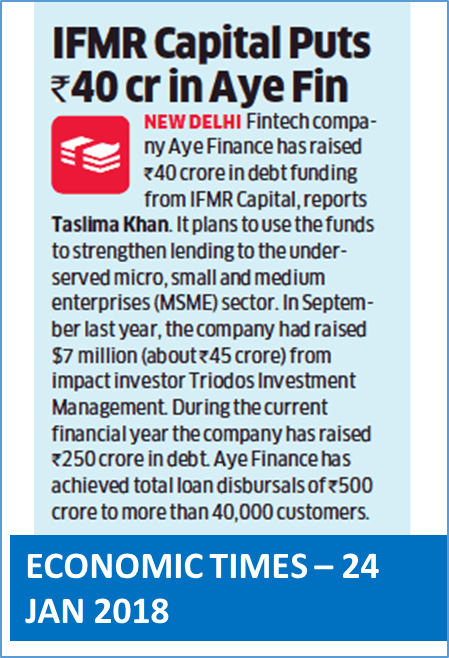 NEW DELHI: New Delhi-based non-banking financial company AYE Finance has closed a Rs 70 crore round of equity funding, led by impact investment firm LGT Impact Ventures, with existing backers SAIF Partners and Accion also participating. Proceeds from the Series B financing round will be used by the two year-old NBFC to expand its footprint, starting with the southern part of the country, and further boosting its overall loan portfolio and its technology platform. “We have a business of Rs 100 crore in outstanding loans, having lent to more than 10,000 customers. 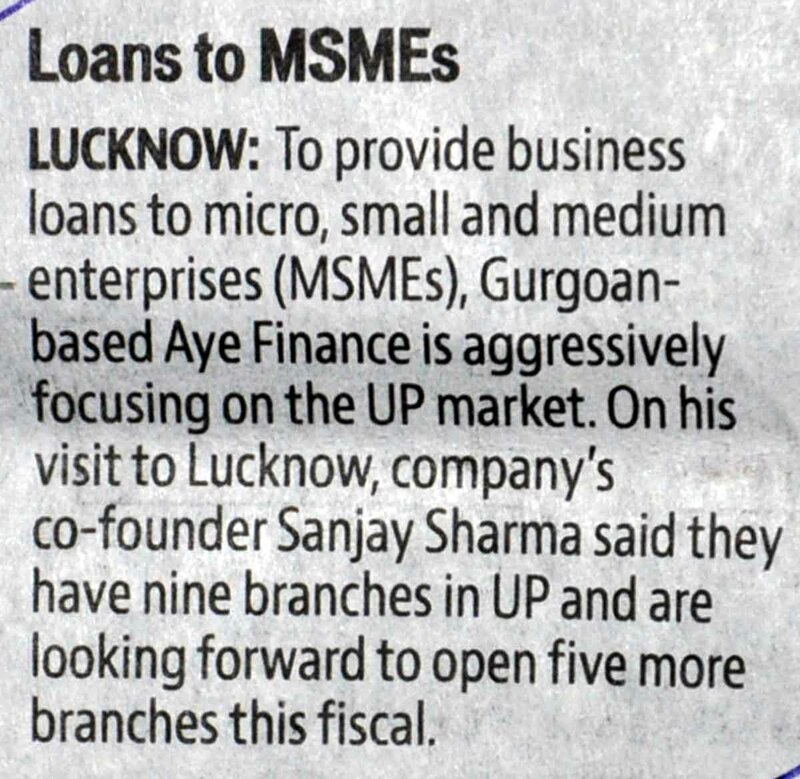 We currently have 31 branches across the country, and while this funding will help us to grow our branches in the North, it will also help us to develop our network in the South,” Sanjay Sharma, co-founder, AYE Finance. According to Sharma, the NBFC expects to close fiscal 2017 with a loan book of between Rs 175 crore-Rs 200 crore. “Most of the funds will go towards providing loans…While we have already invested a certain amount in technology, we want to now go to the next level of using data analytics and insights to really modernise our business further,” Sharma said. Founded by two banking professionals, Sharma and Vikram Jetley in 2014, the NBFC provides loans ranging from Rs 50,000 to Rs 10 lakh, and focuses primarily on micro and small enterprises operating in the manufacturing and services sectors. 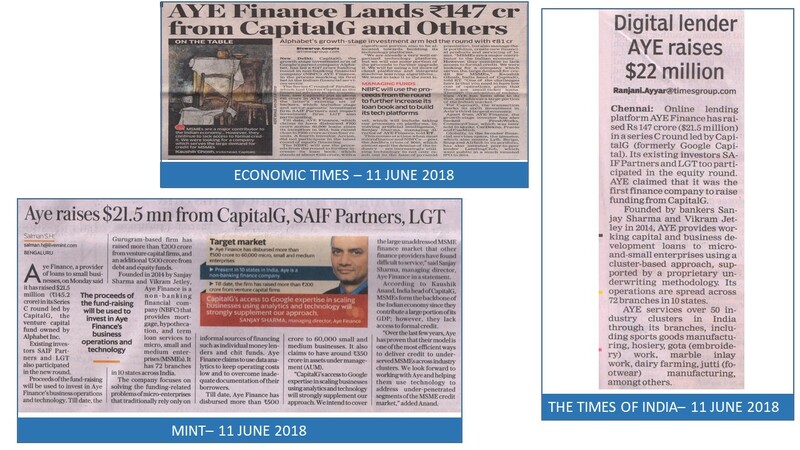 “It (AYE Finance) has been founded on an innovative and insightful process that derives the best from its highly experienced promoters, and a high-energy team united under a shared vision,” said Jasjit Mangat, partner with LGT Impact Ventures. According to MSME Ministry’s annual report for 2015-16, the sector in India today is a network of 51 million enterprises, providing employment to 117.1 million persons, and contributing 37.5% of India’s GDP. However, the segment continues to suffer from lack of access to capital. SAIF Partners, which manages assets of about $4 billion, and Accion, a leading global non-profit social investor, had, reportedly, invested about Rs 20 crore in AYE Finance in December last year. Prior to that, both investors had put in an undisclosed sum in the NBFC in February 2015. 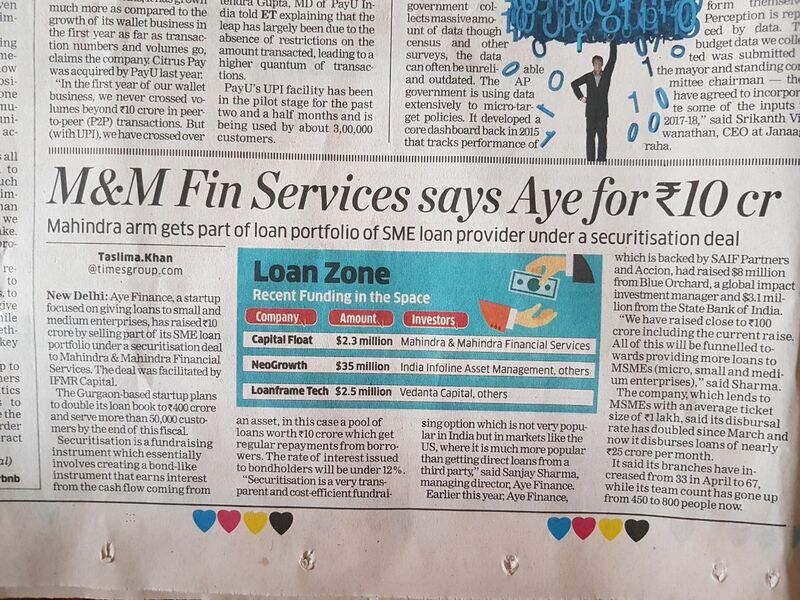 “We believe that AYE Finance has developed the right set of capabilities to profitably serve the underserved space of MSME Finance,” said Vishal Sood, partner, SAIF Partners. 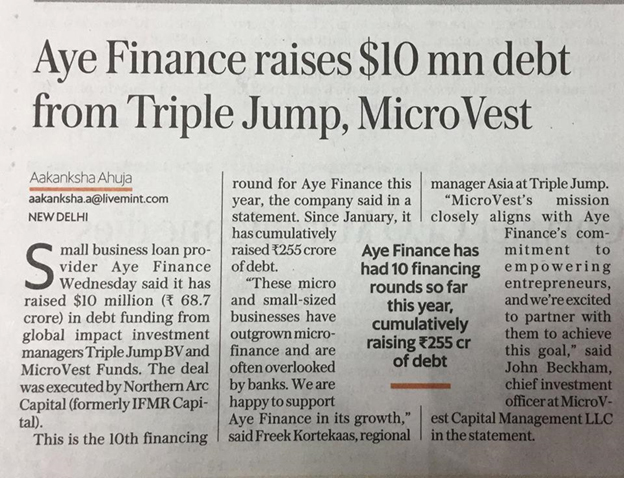 Aye Finance, an India-based lender for the profitable micro, small, and medium enterprises (MSMEs), has raised $1 million investment from SAIF Partners and Accion. Earlier this month, SAIF Partners also participated in the $13 million investment round of Capital Float (with Sequoia Capital). The debt gap for MSMEs in India is estimated to be $198 billion, and is increasing at 11 percent per year, according to a report by Intellecap and the International Finance Corporation. Aye joins a number of actors like Capital Float, Mandii and many others who are attempting to serve this sector, alongside the Indian government’s renewed focus on supporting MSMEs. These enterprises are often locked out of both traditional microfinance and commercial capital. Aye Finance addresses this need by formalizing the lending process and offering secured loans as low as $1,000 at market rates. Aye Finance, based in northern India, was founded by two veteran bankers, Sanjay Sharma and Vikram Jetley. Sanjay said that the 40 million organized micro-businesses are the fastest growing industrial segment, nourished by the aspirations of the Indian working classes. Aye claims to use new-age mobile and cloud computing which lowers the delivery cost and our understanding of industry segments continue to attract a rapidly growing and loyal customer base. With the majority of India’s lending based in the southern states, India’s northern region is marked by sizable levels of poverty and an unorganized sector of informal moneylenders charging exorbitant interest rates. Aye has financed over 300 micro businesses till date, including shoemaking, garments, textiles, leather, auto components, and others. Aye Finance aims to address the ‘missing middle,’ providing borrowers with the capital that all businesses need, no matter their size. Eventually, this access to credit will help more than the MSMEs – it will also benefit the clients and employees who rely on these entrepreneurs, and the local economies that grow along with successful enterprises. SAIF Partners and Accion announced co-investments in Aye Finance, an India-based lender that will serve thousands of profitable micro, small, and medium enterprises (MSMEs), which are often locked out of both traditional microfinance and commercial capital. Accion made its investment through Venture Lab, a $10 million initiative dedicated to providing seed capital and management support to innovative startups expanding financial access to the poor and underserved. SAIF provides seed, early, and growth stage capital for emerging companies in India and China. For over 13 years, it has been investing in India, and its portfolio includes a number of financial institutions. SAIF continues to partner with strong teams and pursue innovative business models across sectors and stages of investments. The debt gap for MSMEs in India is estimated to be $198 billion, and is increasing at 11 percent per year, according to a report by Intellecap and the International Finance Corporation. Aye joins a number of actors attempting to serve this sector, alongside the Indian Government’s renewed focus on supporting MSMEs. By formalizing the lending process and offering secured loans as low as $1,000 at market rates, Aye Finance will address an important need, and help India’s burgeoning economy on its growth path. Aye Finance, based in northern India, was founded by two veteran bankers, Sanjay Sharma and Vikram Jetley. With the majority of India’s lending based in the southern states, India’s northern region is marked by sizable levels of poverty and an unorganized sector of informal moneylenders charging exorbitant interest rates. Aye has seen tremendous demand for its services since launch, opening 4 branches in the last 6 months, and has already financed over 300 micro businesses. Aye Finance’s clients represent a number of industries – including shoemaking, garments, textiles, leather, auto components, and others. 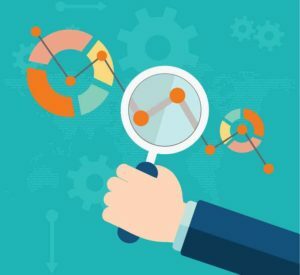 “By getting to know these businesses that ‘cluster’ together in specific neighborhoods or districts in urban areas, we believe Aye can uniquely acquire and assess customers in a low cost manner that mainstream financial institutions have so far found uneconomical. This is a subtle, but powerful innovation that will transform the approach to small businesses’ finance,” says Vishal Sood, Managing Director, SAIF partners. Though startups in India raised nearly US$5 billion from venture capital funds and angel investors last year, a large number of young companies still find it tough to access capital, especially if they don’t want to share equity with VCs. Banks tie them up in red tape, informal moneylenders demand too much for too little, and microfinance companies have far too little to offer these entrepreneurs. Indian lender Aye Finance, which aims to mitigate this problem, has just bagged US$1 million in funding from SAIF Partners and Accion. This is the second such investment by SAIF Partners. Just last week, CapitalFloat, a startup which has broader parameters than traditional banks to evaluate the financial health of SMEs and provide working capital, raised US$13 million in series A funding from SAIF Partners and Sequoia Capital. CapitalFloat had raised US$2 million from Aspada and US$1 million from SAIF Partners last year. Both Aspada and SAIF upped their stakes in the company with the latest investment. 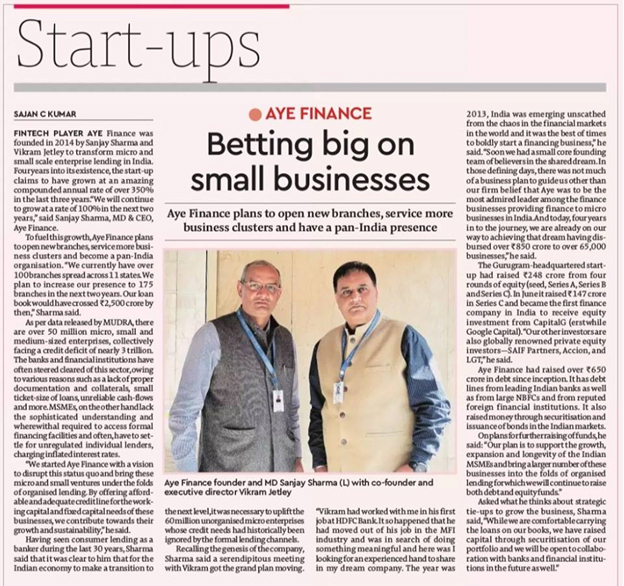 Founded by veteran bankers, Sanjay Sharma and Vikram Jetley, six-month-old Aye Finance has financed over 300 micro businesses in diverse industries, including textiles, auto components, and even leather products. 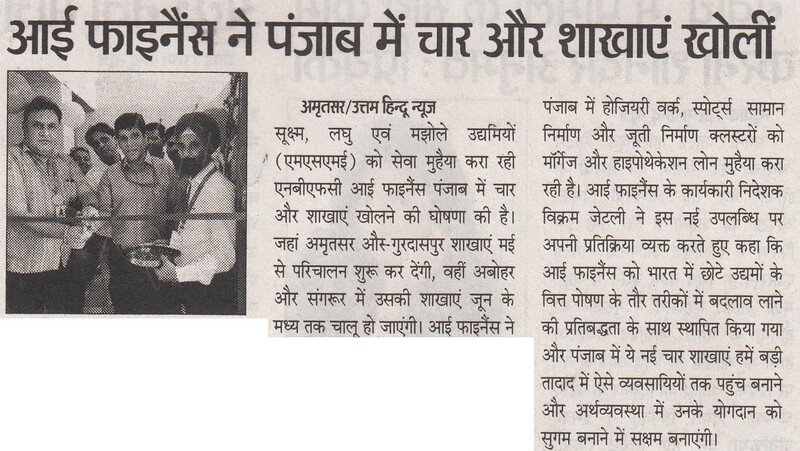 It has four branches in north India. “Our use of new-age mobile and cloud computing lowers the delivery cost and our understanding of industry segments continue to attract a rapidly growing and loyal customer base,” says Sanjay Sharma, adding that organized micro-businesses are the fastest growing industrial segment in India. According to a report by Intellecap and the International Finance Corporation, the debt gap for MSMEs in India is estimated to be US$198 billion, and is increasing at 11 percent per year. India has a huge micro, small, and medium-sized business (MSMB) market base, which at 47 million is second only to China’s 50 million. “Too small for commercial finance and too large for traditional microfinance, these entrepreneurs must make do without the working capital they need to expand their businesses, buy bulk materials, or hire new employees. Aye Finance will address that “missing middle,” providing borrowers with the capital that all businesses need, no matter their size,” says Accion CEO Michael Schlein in an announcement on the funding. Accion made its investment in Aye Finance through Venture Lab, a US$10 million initiative to provide seed capital and management support to innovative startups expanding financial access to the poor and underserved. 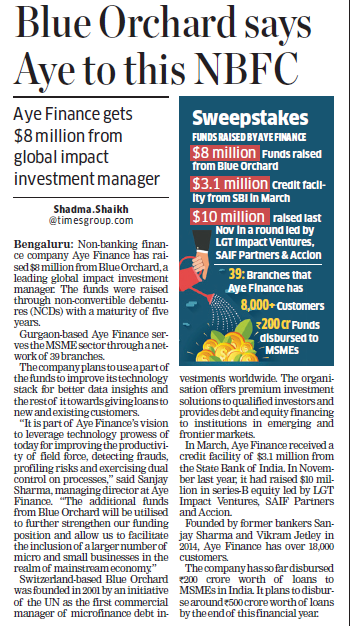 BENGALURU: Delhi-based non-banking finance company Aye Finance has raised Rs 20 crore in a new round of funding from existing backers, venture and growth capital investor SAIF Partners and financial inclusion-focused firm Accion. 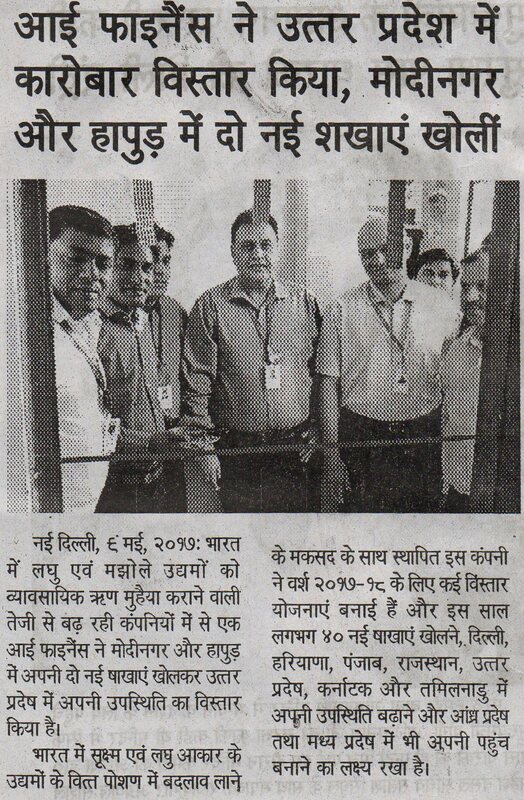 The new round follows Rs 6 crore invested in Aye earlier this year by them, as the firm targets 30,000 small businesses and industries like brass casting makers in Aligarh, shoemakers in Agra and sports goods makers in Ludhiana. 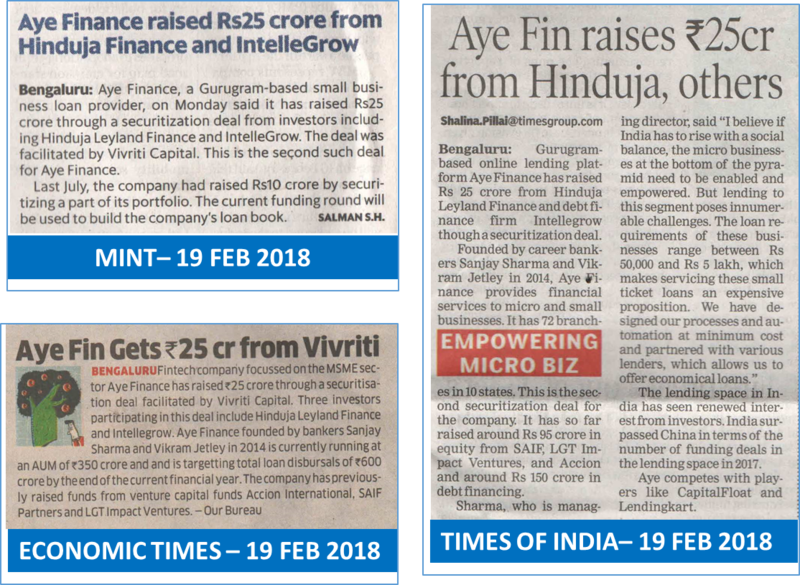 “We had agreed to invest this additional amount at the time of our first investment in February,” said Vishal Sood, MD at SAIF Partners, which has also backed listed financial services players like Karur Vysya BankBSE 0.85 % and EdelweissBSE 1.98 %, beside online small business lender Capital Float. 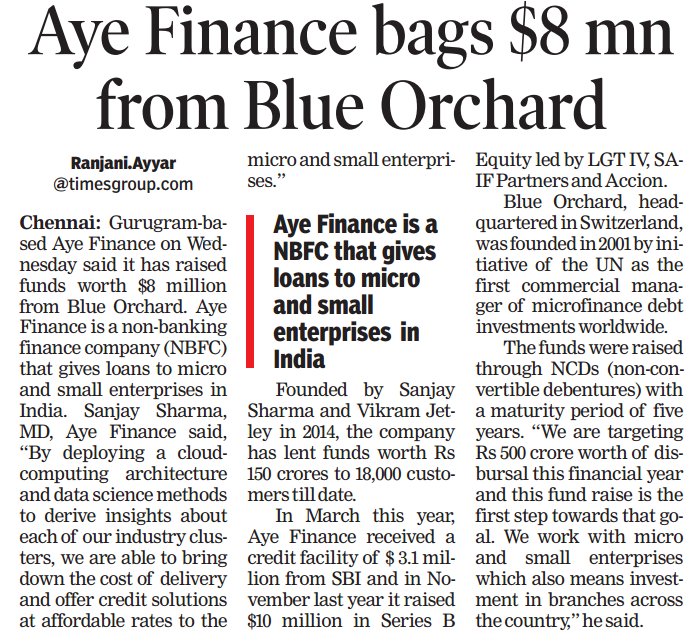 Aye Finance started operations two years ago and has disbursed loans of Rs 25 crore to 2,000 borrowers. With this funding, the company plans to expand this to Rs 200 crore in the next one year. Aye Finance was founded by Sanjay Sharma and Vikram Jetley, both of whom earlier worked at Ujjivan Microfinance, besides banks like HDFC BankBSE 0.97 %, ICICI, HSBC, National Bank of Oman and IDBI BankBSE 1.18 %. Aye Finance primarily targets loans of Rs 50,000 to Rs 1.5 lakh, for which it takes items like machinery or inventory as collateral. These loans are given at an interest rate of 21-28%. 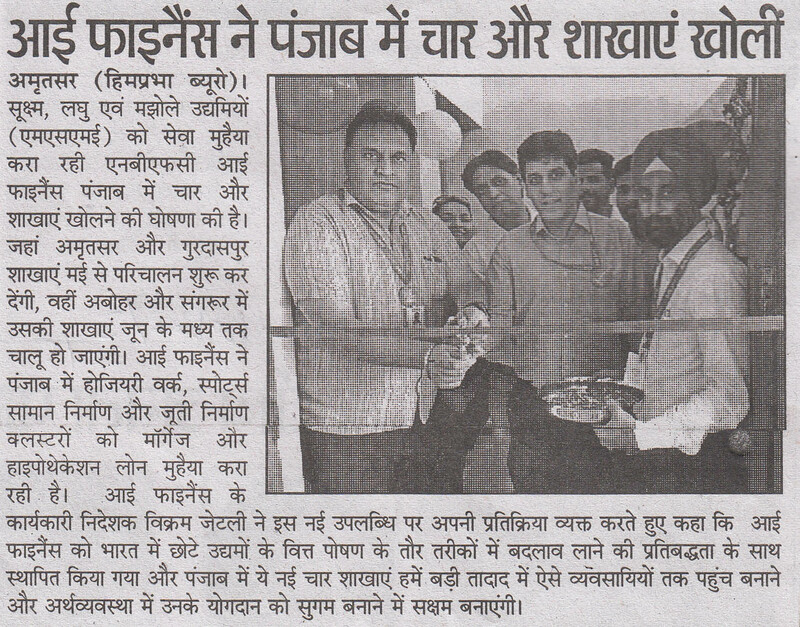 The company also offers loans of up to Rs 10 lakh where it takes property as collateral. According to a November 2012 report by the International Finance Corporation, overall finance demand of medium, small and micro enterprises totals Rs 32.5 lakh crore. Just about a fourth of this demand is met by formal banking sector with loan sizes mostly ranging from Rs 5 crore to Rs 20 crore. Investors see opportunity only growing in this market. 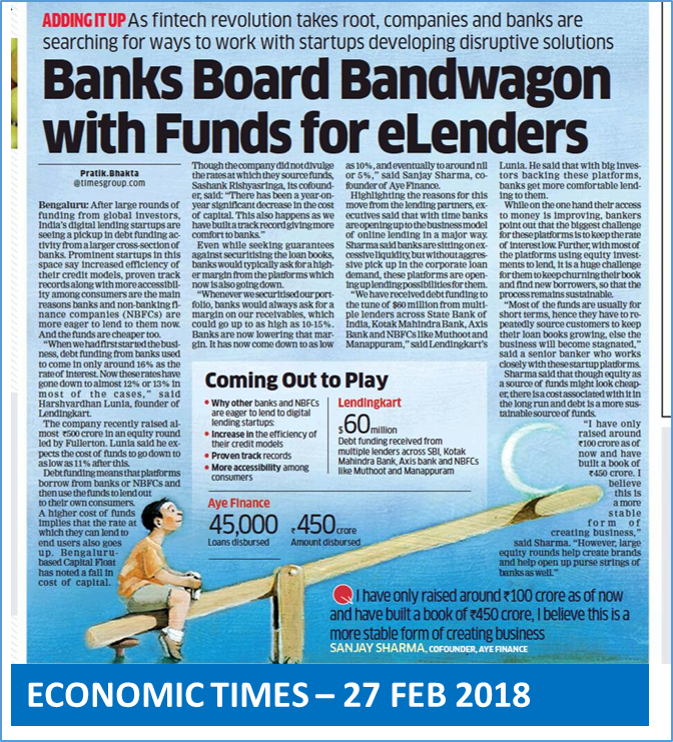 “Largely this segment where loan requirement of Rs 50,000 to Rs 1 lakh is not served by either banks and microfinance institutions, and growth in an economy has to come from MSMEs,” said Abhishek Agarwal, country director at Accion, which has made over a dozen investments in firms such as IFMR Holdings and Swadhaar.